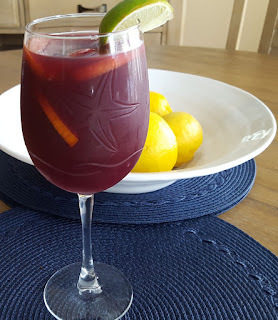 Everyone needs a great red wine sangria recipe for summer entertaining and this is mine. Actually, this is Hubby's specialty. He's the cocktail maker in our family and he loves to make this sangria whenever we are entertaining a group of friends or family on the deck. This sangria has just the right balance of sweetness and fruitiness making it a yummy, fruity, summer sangria that everyone loves. The key to this recipe is finding a sweet red wine that works for your taste buds. Sweet red wines are not our thing when we are selecting wines. We found our favorite sweet red wine for this recipe when we toured the San Sebastian Winery in St. Augustine, Florida. During the tour, it was suggested that their San Sebastian Vintner's Red would be tasty in sangria. We didn't like it as a stand-alone wine but did find it to be perfect in this sangria. You'll want to find a similar wine that is both robust and sweet so that you won't need to add additional sugar to the sangria. Fruit is important in a sangria, so don't skimp on the fruit. We love adding apples, pears, and grapes to this sangria. You'll find that the apples and pears absorb the wine and rum when you make your sangria in advance and let it sit. That makes the fruit a yummy bonus treat to munch from the sangria glass. We always use spiced rum in our sangria. You can use a white rum if you prefer but we think the spiced rum adds a little extra flavor that makes this sangria special. You'll want to be sure you have a pretty glass pitcher for mixing your sangria. Make sure the pitcher is clear so you can see the pretty fruit floating in the sangria. Everyone loves the fruit! I like to add some carbonated soda to my glass of sangria, but Hubby prefers his straight from the pitcher. 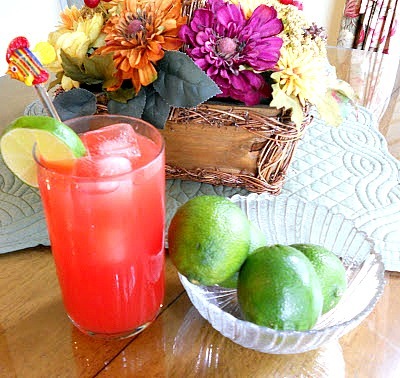 I usually choose either Fresca or Sprite Zero because they go well with the lemon and lime that are used in this recipe. 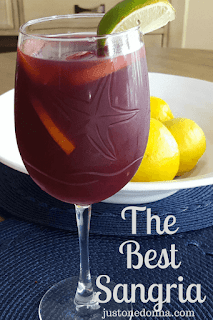 You'll love this tasty red wine sangria to share with friends and family. Don't skimp on the fruit. It's essential. Prepare this sangria at least four to six hours before serving to allow the flavors to meld. 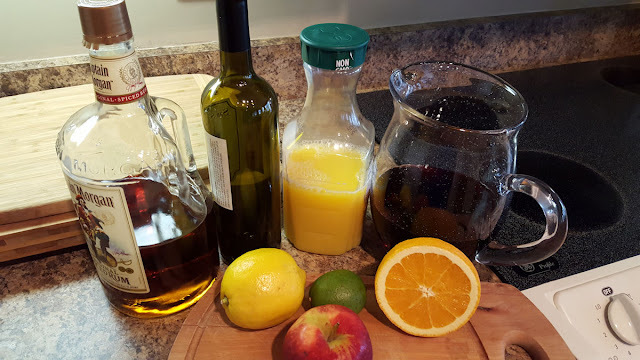 Pour the wine, spiced rum, and orange juice into your pitcher. Add the fruit to the pitcher. Reserve some slices of fruit to garnish your glasses. You might like this recipe for rum punch. It is another of our favorite summer entertaining cocktails. Thank you for sharing this recipe on Pinterest, Facebook, Twitter, and Yummly.